As time went on and sampled sounds began to kick the chair out from under the Simmons monopoly, the company diversified in some frankly strange directions… and that’s where the Trixer comes in. 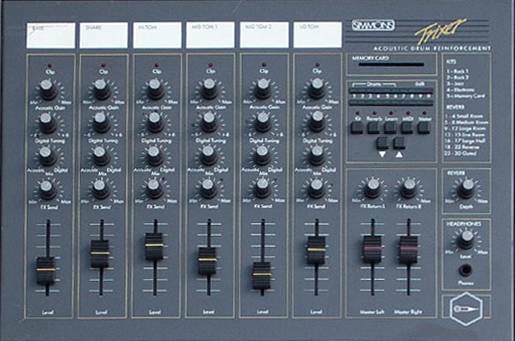 Half mixer, half, erm, box of tricks (? ), it coupled four kits’ worth of classic Simmons SDS sounds ripped from their top-flight ‘brains’ with audio sensing and trigger pad options and rolled the whole lot into an audio mixer built like a tank. The idea was that drummers could run their own drum mics through the Trixer, which would trigger its onboard sounds along with the incoming audio. Classic SDS tone could then be blended into the drummer’s own kit sound, beefing up whatever they happened to be playing and lending any acoustic kit that Simmons Sound edge. In practice, the Trixer (and let’s just take a moment to reflect on how utterly crap that name really is) failed to set the world alight and save Simmons. In fact, the only thing that makes it worth a second glance is that it does pack four kits of genuine SDS sounds into one box. True, you can’t program them or get them out without an audio or trigger input, but then that’s what we’re here for, right? Rhythmic Robot’s version of Trixer takes all 20 sounds from the original frankenmixer and slots them into your DAW ready to program. All four kits are covered: two Rock kits, a Jazz kit and an Electronic kit (our inevitable favourite here in the lab). Each kit piece was sampled multiple times because the Trixer varies its sound quite widely, and you have control over level, pan and tuning on a per-kit-piece basis. We also discovered one of those useful glitches that tend to crop up in old electronic boxes, which generates a “snare roll” – and which we captured and looped. All in all, there are some really punchy, 80s-style sounds here, which instantly bring to mind countless classic hits of the past. Bill Bruford, Phil Collins, Sigue Sigue Sputnik, Prince, Talk Talk, Van Halen, Spandau Ballet, Culture Club, Ultravox, Pink Floyd… the list of notable Simmons users reads like a who’s who of 80s rock and pop legends. This is your chance to put on a headband, rip your jeans up real good, and rock out with the best of the best. More power to your pads! Come on, people. Simmons drums for pocket change? Worth a punt for the sheer fun of it. Back in the day, drummers went into debt to get this sound. This is just perfect for 80’s drum fills. Been looking for Simmons drums for awhile now, and this the best deal Ive seen period. Simmons drum sounds – anyone wanting an 80s flavour will go for this but you can do rather more, courtesy of the saturate/distort/bitcrush and compress controls. 4 kits, essentially, mapped across the keys, and you can tune the sounds too. Very meaty samples, full of depth. No touch sensitivity which is a shame but that really is quibbling at the price. Excellent recordings. Really enjoying these. So much so that I think I have just about purchased everything RR has to offer. Just what I needed for my 80s sound! easy to use,reliable and most important: great sound!the saturation is top notch! Trixer is quite awesome. I loaded it on Kontakt and pressed few keys on my MIDI keyboard. A thunderous tom roll filled the air. Nice. I’m a big fan of the sounds of the eighties and this is a great addition to my sound palette. Just hearing those few tom hits gave me lots of inspiration to create new music. The controls are simple but versatile, the instrument looks good, the price is very reasonable and the sound is just amazing. Recommended for fans of the eighties. Most well-spent money of my career. Expertly recorded, and an absolute monster if you apply the built-in compression and saturation with care. Add convolution reverb and feel the lycra. I am just using them for some digital Dancehall! Perfect! Great for getting that eighties sound! With the “Saturate” and “Compress” knobs at 50% through some gated reverb, these drums sound amazing! Perfect tool to thicken weak acoustic drums!